Our Abpromise guarantee covers the use of ab51014 in the following tested applications. Plasma membrane-associated small GTPase which cycles between active GTP-bound and inactive GDP-bound states. In its active state, binds to a variety of effector proteins to regulate cellular responses such as secretory processes, phagocytosis of apoptotic cells, epithelial cell polarization and growth-factor induced formation of membrane ruffles. Rac1 p21/rho GDI heterodimer is the active component of the cytosolic factor sigma 1, which is involved in stimulation of the NADPH oxidase activity in macrophages (By similarity). Essential for the SPATA13-mediated regulation of cell migration and adhesion assembly and disassembly. The effector region mediates interaction with DEF6. Cell membrane. Melanosome. Inner surface of plasma membrane possibly with attachment requiring prenylation of the C-terminal cysteine (By similarity). Identified by mass spectrometry in melanosome fractions from stage I to stage IV. 15% SDS-PAGE analysis of 3 µg ab51014. ab51014 has not yet been referenced specifically in any publications. Publishing research using ab51014? Please let us know so that we can cite the reference in this datasheet. This product is good for functional assays. 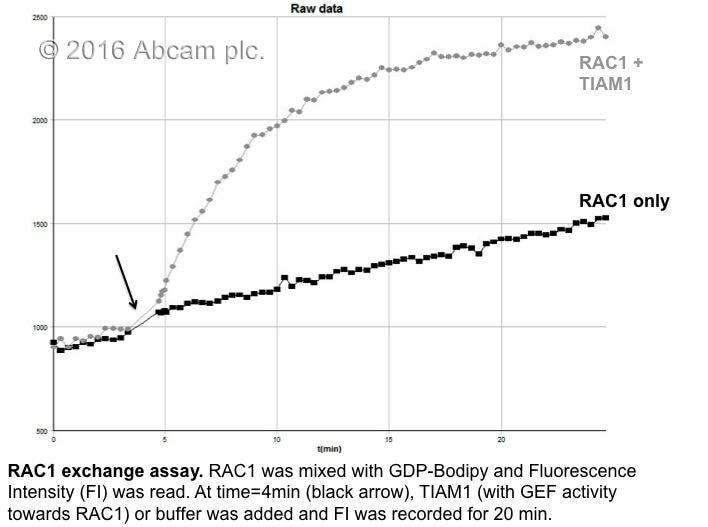 I step up an assay using RAC1 and Bodipy-GDP, a fluorescent analog of GDP. The fluorescence of Bodipy-GDP is quenched in solution and increases upon binding to RAC1. The nucleotide exchange capacity of RAC1 was then tested by adding TIAM1, a guanine exchange factor with selectivity for RAC1. Fluorescence intensity (FI) was recorded for 25 min. Addition of buffer (vehicle) to the mixture of RAC1 and Bodipy-GDP resulted in the expected slow increase in FI due to RAC1 own's ability to exchange GDP. Whereas addition of TIAM resulted in a far quicker increase in FI. Both results indicate the functionality of RAC1 in this assay.